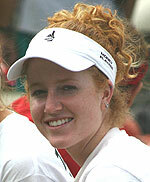 The USTA announced that Sierra Poske of Ponte Vedra Beach, Fla., has won the Bill Talbert Junior Sportsmanship Award. This award is presented to a Junior who exemplifies the finest quality of sportsmanship in tournament play and the finest traditions of the great sportsmen of tennis past and present. Poske is the back-to-back Florida Times Union Player of the Year. She is currently ranked 11th in the country in the 18s and 4th in the Florida in the 18s. She has won eight National titles, representing Florida every year since 1999 in a team event and was a finalist twice in the Father-Daughter competition. In 1999, Poske won the 14s Team Florida Sportsmanship Award and the ATP Gator Bowl Sportsmanship Award. In 2000, she was the winner of the 14s Zonals Sportsmanship Award. A full-time student high school senior taking AP (college) level courses, Poske is a member of the National Honor Society with a 4.1 GPA. She is a tutor for underclassmen and does other volunteer work for the NHS. Poske is an active volunteer in the community. She was a regular volunteer for the (Tony) Boselli (a member of the NFL’s Jacksonville Jaguars) Foundation in Ponte Vedra Beach. This foundation provided scholarships to underprivileged students with athletic talents. She has also donated hundreds of books to the Ponte Vedra Beach Library and also volunteers at the local library in a group called the Volunteens.